Fair. Volume I only. This is the 1917 edition. No dust jacket. Bumping, discolouration and marks to spine and boards. Spine cloth splitting. Page edges tanned. Smudges and other marks on several pages. Damage to front hinge but binding is intact. This book is from our pre ISBN stock and could therefore be over 50 years old. It will have a general appearance commensurate with its age including age effects to page edges, binding and boards. Dust jacket is absent unless otherwise stated Major signs of w.
Good. Ships from the UK. Former Library book. Small Quarto. Cloth Hardback, 1892 Seventh Edition...Ex-Library books, with usual library treatments. xxxv + 695, xii + 826 pp + adverts (2p). Hinges, cracked. Textblock, sturdy. Pages, clean and intact. bound in dark green cloth with gilt lettering to spine edges. Usual bumps and rubs to extremities with cracked spine joints and scuff marks and library reference number handwritten in white pen to lower spine edges. While we seek perfection, we are still human and occasionally make mistakes. 2.6 kg. Photographs available on request. Offered by the Rare & Collectable Books department of Better World Books UK, Your purchase supports literacy charities. Good. Previous owner's inscription/signature inside cover. Undated. Wear/marking to cover. Volume 1. This is an ex-library book and may have the usual library/used-book markings inside. This book has hardback covers. In fair condition, suitable as a study copy. No dust jacket. Gilt on backstrip. Blind-stamping on covers. Bumped corners. Slightly loose binding. Internally fair. Volume 1. This is an ex-library book and may have the usual library/used-book markings inside. This book has hardback covers. In fair condition, suitable as a study copy. No dust jacket. A book of extreme detail and distinction. 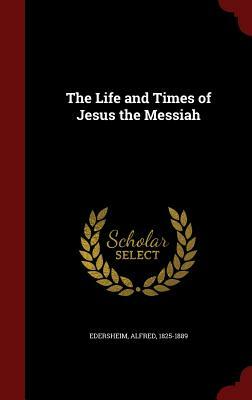 An extensive look into the times and culture of the Jewish society at the times of Christ. Most beneficial for anyone seeking to get a closer look into New Testament teachings.